When I turned off the car this morning, the driver side parking light remained on, although the lights and vehicle were turned off. The lights have remained on since (2 hours). Is the car trying to tell me something? Checked the manual and didn’t see anything. We would assume that you either have a faulty Lighting Control Module (LKM) or you have the street parking lights activated. The street parking lights are activated by switching the turn signal switch to the left or right direction, with the key removed, then exiting the vehicle. The front and rear parking light on the side that is activated will stay illuminated. If only the front parking light is on, the LKM is likely at fault. The LKM controls all of the exterior lighting on the vehicle. Common faults for the LKM may be various lights that operate (or do not operate) intermittently or perhaps permanently. If a bulb is staying lit (on), this is likely an LKM fault. On the E46 chassis (3-series 99-05) the LKM is incorporated into the main headlight switch. The headlight switch and module assembly are relatively easy to replace. Just pry off the horizontal trim panel that surrounds the switch and then remove the screws that secure the switch to the dash … pull the switch assembly out. 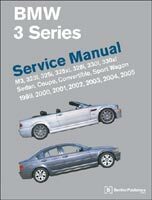 The procedure is covered (with photos) in the Bentley repair manual. The replacement module and switch assembly must be coded to the vehicle, as well. The switch/LKM unit is specific to model production dates and various options on the car. Please feel free to give our agents a call at 800-535-2002 for ordering assistance.